With campaign tracking you can create shortened tracking links, group these URLs logically, and monitor the number of clicks they receive in order to measure the success of your campaign. You can deliver customized content or a specific survey to engage campaign visitors. 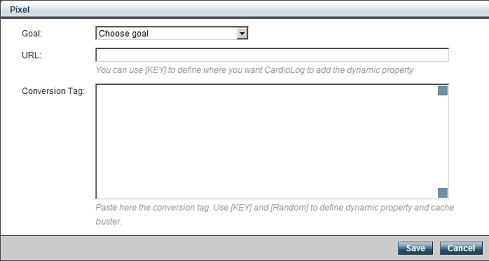 You can also define conversion tags in order to notify your affiliates when goal conversions take place. 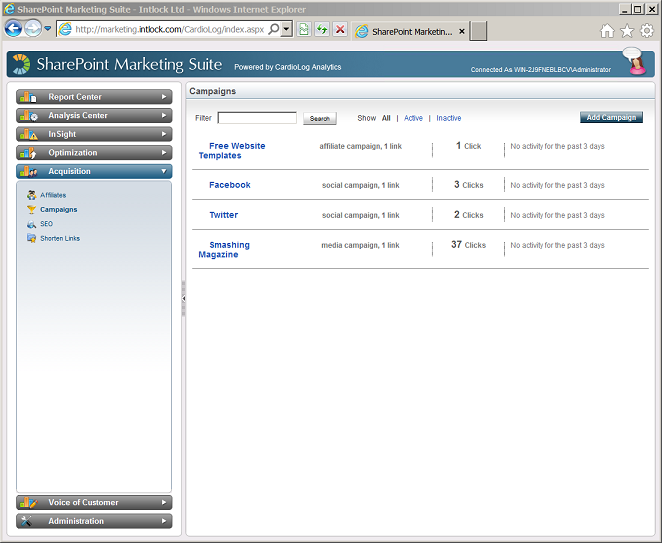 On the main Campaigns page, click Add Campaign. Fill in the name of the campaign, along with its type and source. The type (medium) and the source provide specific information about the campaign. Campaign Name - The campaign name should describe the campaign you are running. Here you are able to specify the promotion or the slogan of the campaign. For example, if you run a special promotion for Christmas, you can identify the campaign as "Christmas Sale". Campaign Type - The medium the campaign is using. For example, if you drive traffic from a newsletter, the campaign medium can be called "email". Campaign Source - Traffic from campaigns have an origin or source. This source can be a site the visitor came from, or the name of a newsletter or a search engine. For example, if you create a campaign for a specific web-site and you are placing ads there, the source will be the name of that site. Click Save and another two items will appear. Add a new tracking link by filling in the parameters and by creating its shortened link. For each tracking link, you can define two extra dimensions: Term and Content. These two dimensions should be used in such way that will allow you to run several types of breakdowns. For example, for a display campaign (banners), you can use the "Term" field to specify the size of the banner (250x250, skyscraper etc) or the placement of the banner (Header, Sidebar, Popup etc). Additionally, the "Content" will hold the creative type or the content of the ad. Note: Users who click the tracking link will be counted as clicks. If the user clicks the tracking link again it will not count, unless the user clears his cache or does not use cache. Add a new Pixel for your affiliates. Some of the publishers require a conversion tag (or pixel) to be placed in specific conversion points on your site (for CPA campaigns or when you work with blind networks). Using The SharePoint Marketing Suite pixel support, you can define the conversion tag or the pixel you want the Marketing Suite to use when a certain goal is completed. Some of the publishers rely on cookies, while others rely on data passed to the advertiser when they redirect visitors to the landing page. If your publishers use the second method (passing dynamic data to the landing page), please instruct them to send the information they want to receive in a parameter called "CDP" (for example, the URL of the landing page will look like this: http://yourtinyurldomain.com/sf23SAv?CDP=12345). Now, all you have to do is create the pixel and use the placeholder [KEY] to define where you want us to place the value we obtained (12345). For example:http://publisherdomain.com/pixel.php?value=[KEY] - that way, when we initiate a pixel call, we will replace [KEY] with the relevant value for that specific visitor. Use the [Random] placeholder to add a cache buster parameter to the pixel in case the publisher requests it. For example, http://publisherdomain.com/pixel.php?value=[KEY]&r=[Random]. The [Random] placeholder will be replaced with a random number to avoid caching issues on the visitor browser or CDN. Once you have finished editing the campaign click Save. Note - When adding a campaign, a new visitor segment is created for it, which can be used in web analytics reports, Behavioral Targeting and Voice of Customer. On the Campaign page, click Personalize Content. 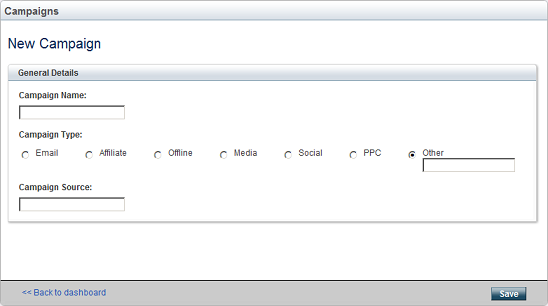 In the popup dialog, fill in the Page parameter by opening the object explorer and selecting an item. Choose or Create new UI Element. Note that using this module requires configuration (See how to configure Shorten Links).